The concept of women and metal is something most people in the world are still not used to. Since time immemorial, it is stereotyped that women must be soft spoken, delicate and composed. So when you have a female metal vocalist or a female rock guitarist, for some people, it’s actually an eye opener. In fact, their worlds turn upside down when they see that a few women do exist to prove most of these people wrong. And we are so glad that they exist, to the extent that we have decided to pay tribute to them on the occasion of International Women’s Day 2019. Celebrating womanhood is all about celebrating empowerment, equal rights and feminine strength. Aptly, these women in rock and metal scene are empowering millions of women worldwide just with the power of their voices of instruments. When it comes to power, Joan Jett is all set for it. She is an American rock singer, songwriter, composer, musician, record producer and occasional actress. Jett is best known for her work as the frontwoman of her band, Joan Jett & the Blackhearts, and for earlier founding and performing with the Runaways, which recorded and released the hit song ‘Cherry Bomb’. The Blackhearts' version of the song ‘I Love Rock 'n Roll’ was number-one on the Billboard Hot 100 for seven weeks in 1982. We still sing to it because we all love rock and roll and we all love Joan Jett. At first glance, Amy Lee doesn’t seem to be much alike her peers with her pretty face and feminine voice. However, this seemingly girly singer also has a formidable side. Rather than her alter ego, it is Amy Lee herself. The vocalist of Evanescence has defined a new meaning of girl power. In 2003, Evanescence skyrocketed into the sun to become one of the hottest bands on the planet, thanks in no small part to the power and emotion of frontwoman Amy Lee. Her operatic prowess and soaring vocals set the five-piece apart from their peers, sending them into arenas across the globe. Over 17 million copies of the debut album ‘Fallen’ has already been sold. 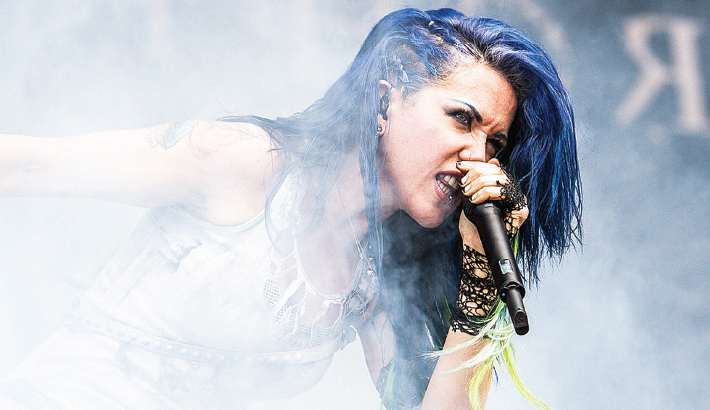 Arch Enemy has been blessed with not one but two strong female vocalists in lead, one after another. After Angela Gossow departed from the band in 2014, we thought it was the end of our favourite melodic death metal band. After all, who could match the pitch and power of Angela? Then came Alissa who surprised us just as much as her predecessor. With her dyed blue and a voice that was raw and unparalleled, Alissa robbed all the fans and created new ones. Even if you are not a fan of either rock or metal music, you have still probably heard of Orianthi. The blonde Australian musician, singer and songwriter is hard to miss and have given blonde beauty’s a new meaning, one that is full of strength and power. Orianthi has worked with almost every known face- from Michael Jackson to A.R. Rahman. She has also worked with Alice Cooper band and has earned her name in “12 Greatest Female Electric Guitarists” by Elle Magazine. Besides them, there are tons of other women in metal who have made all of the women proud. The list includes Tarza (Nightwish), Vibeke Stene (Tristania), Elize Ryd (Amaranthe, Kamelot), Charlotte Wessels (Delain), Anna Murphy (Cellar Darling, Eluveitie), Lzzy Hale (Halestorm), Brittany Slayes (Unleash the Archers), guitarists Lita Ford and Jennifer Batten.